If you are searching for an easy dessert recipe, then this marie biscuit pudding is a perfect choice. It is so simple to prepare, the ingredients needed are easily available and the good thing is that it can be prepared a day ahead making it a perfect choice for parties and get togethers also. Today let us learn how to make biscuit pudding following this easy recipe with step wise pictures. Prepare coffee decoction in 1 cup of boiling water. Filter it and leave it to cool. Sift the cocoa powder and keep it aside. Line a 7 inch square cake tin with cling film leaving a little extra on one side to fold over the top. Alternatively you can layer the whole thing in a square pan or glass dish without the cling film, if you plan to serve it directly from the tin. But with the cling film lining, it is easier to take the whole biscuit cake out from the pan and slice it as preferred. In a bowl, beat together butter and sugar until light and fluffy. You can use a wooden spatula or an electric hand mixer. Add cocoa powder and continue beating until well mixed. Now dip the biscuit one at a time in coffee decoction and arrange it in the pan as shown in the picture below. It doesn't matter, if the biscuits overlap. With a spatula, spread the butter + sugar +cocoa powder mixture over the biscuits evenly filling all the gaps and corners (see picture below). 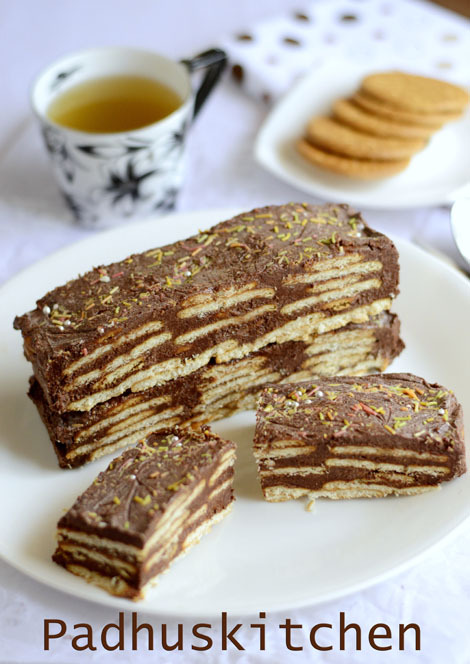 Repeat with another layer of biscuits dipped in coffee decoction and top it with another layer of cream. Note - The pudding will melt if kept outside for a long time. So keep it in the refrigerator and take it out only when required. You might like my no bake chocolate recipe also. simple, quick and very tempting dessert. definitely a good one ! I will try it..it looks so good ..
Beautiful pudding, extremely inviting and droolworthy. I used to make chocolate rolls using marie biscuit as a kid.. Loved this recipe.. The pudding cake looks yummilicious. Love the detailed description with pics. how long do u leave it in the fridge for? Barney stinson - Leave it in the fridge until it sets..
Can I add ghee instead of butter? Butter is best for this recipe. One of my friend made it yesterday as per your recipe and truly it tasted yummy. But my only concern is, how can you call it a pudding? Isnt it more like a tart or pie, cause puddings are supposed to be semi solids. Just like the pudding my mom makes! Looks really good. You cannot keep it outside. Where is the icing sugar used?? Read the first line under METHOD "In a bowl, beat together butter and sugar until light and fluffy. You can use a wooden spatula or an electric hand mixer." As I have already mentioned as icing sugar in the ingredients list, I have just mentioned as sugar (icing sugar) in the method. Was so good. I made it twice. Delicious and simple. Can we use Normal sugar instead of icing sugar. .
You can powder regular white sugar finely. Hi, recipe looks great and I want to try it. How long does it hv to be set, minimum time? I might need to make it and serve it the same day. Thanks! What can I replace coffee with ? Try dipping it with milk.